100% real pressed flower and foliage arrangement. For use as a sticker or DIY design element. 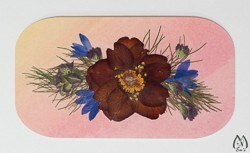 Enjoy the beauty of real flowers as a sticker or design component in your own crafts or mixed media. Sticker with rounded edges is 3 3/4" long by 2 1/16" wide with laminated cover for protection. Works well in either a horizontal or vertical orientation. Flowers include geum, oregano florets and bachelor button florets. One-of-a-kind, what you see is what you get. Most flowers and leaves are picked by Em and from the Pacific Northwest or grown in Em's Garden assuring you quality and freshness. Please Note: The reproduction and copyright for all product images remain the property of Em's Place Inc., and cannot be used without written consent or license. Visit the Ordering Information page for more details.